WhatsApp already offers a ton of features to its 1.5 billion monthly active users, but the ability to communicate with businesses and brands has opened new avenues for the messaging giant. 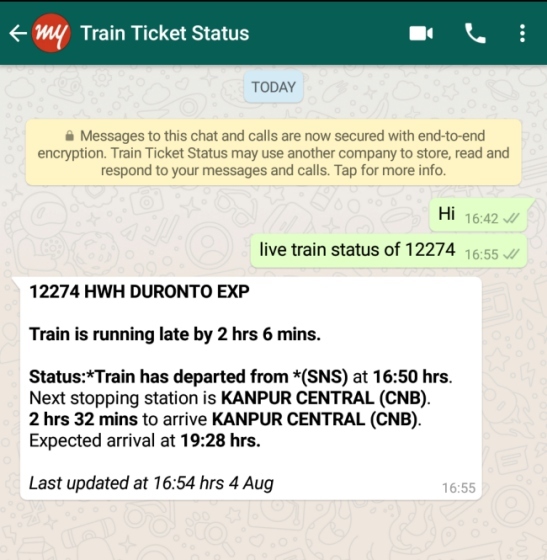 One of these services is offered by Indian Railways in partnership with well-known online ticketing platform MakeMyTrip, which enables you to check the PNR status of booked tickets and the live running status of trains using a simple text message. This saves users the trouble of logging into the IRCTC website and jumping through menus to view their ticket status. 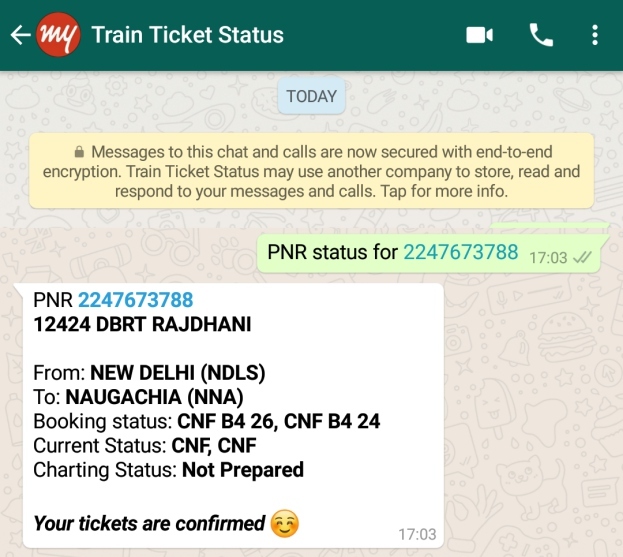 To check out your IRCTC ticket booking status, you need to send a message with the following text – ‘PNR status for PNR number>’ to MakeMyTrip’s WhatsApp contact. The response will include the train number, name, along with the source and destination station at all times. However, the status will show ‘your tickets are confirmed’ when the seats have been allotted to you, else you will see the update waitlist numbers for the same. To check out the live status of your train, you need to send a message reading, ‘Live Train Status of <train number>’ to the number. If the train has departed, then the response will include info on whether it is running on time or not, when it departed a recent stop, and how long will it take to reach the destination. If not, you will see a response saying that the train has not started from the source station, along with the expected time for departure. In addition, MakeMyTrip adds that your bookings will also appear in this conversation. It will send you messages about vouchers, refund & cancellation, flight web check-in status and more. While this is certainly a handy feature to have, one can only expect an onslaught of such services in the coming weeks. I say this because WhatsApp has just recently unveiled the WhatsApp Business API that will allow brands to seamlessly interact with consumers and integrate it with their apps as well. MakeMyTrip’s sister platform Goibibo has already started work towards the integration of WhatsApp into its services. It now allows users accessing their mobile website to log into their account using WhatsApp, which is sure a nifty feature for forgetful users. This shows us that we can expect other popular services to follow suit and deliver similar experiences via the messaging app.